High Quality Content by WIKIPEDIA articles! The Velocette KSS was a British motorcycle made by Velocette. The final development of the K series (the K rather curiously stood for Camshaft and the SS for Super Sports) The KSS remained in production in various forms until 1948.A production roadster motorcycle, the KSS was modified with a racing clutch and tuned to achieve 90mph around the Isle of Man TT course, largely due to the excellent handling. 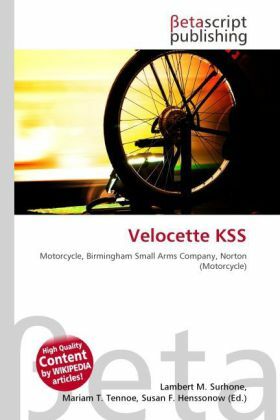 Important improvements included the positive-stop foot operated gear change from the Velocette KTT production racing version.